This is a history of my K Code Mustang 6T09K104302 from what I have been able to gather through my research and documentation. She was ordered by McCotter Motors Ford of Titusville Florida sometime in the summer of 1965. She was probably ordered to have a showcase Mustang on their lot for the 1966 model year. 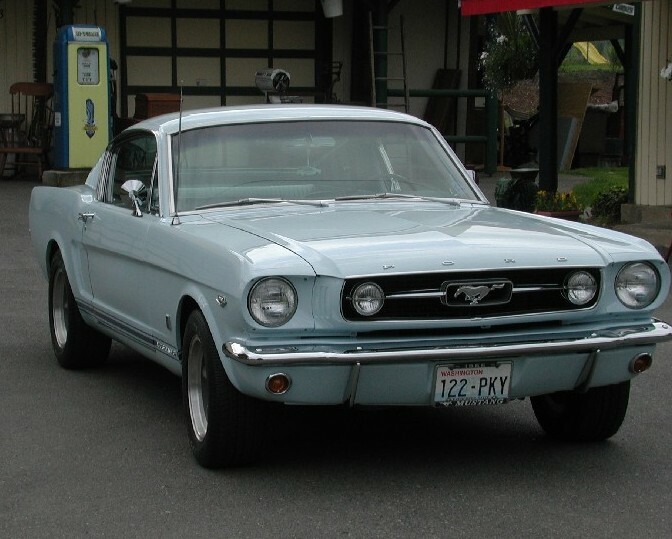 The car they ordered was a 1966 High Performance Fastback GT with some great options like the deluxe (pony) interior, rally pack ,traction lock differential and styled steel wheels. 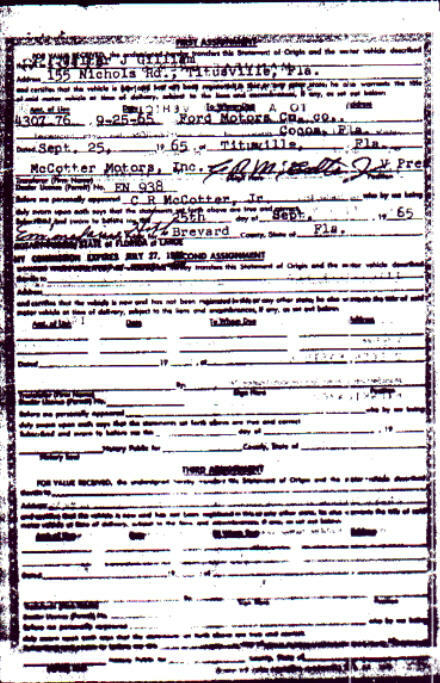 She probably was the envy of all lookers on the lot that day and until she was sold to her first owner Walter Gilliam on September 25th 1965 for the sum of $4307.76 according to the first assignment listed in the MSO. Wow a lot of money then considering that a Boss 302 four years later cost about the same or even less. I can come close to that number when I figure in all the options, the transportation and tax but there is still a $200 difference. I think this is another example of more second sticker pricing or bidding war even into the second year of Mustang production. Pretty cool! Man she was some car, fully decked out High Performance Mustang for those warm and beautiful Florida beach cruises. She lived in Florida most of her life. She was purchased by Willet F Starnes her second owner for 1,284.00 in 1968. Willet took out a loan from the 1st National Bank of Merritt Island and he satisfied that loan in 1971 he had her for a couple more years and then sold to a J.R. King in the summer of 1973. J.R. sold her to Mrs. Laddie Rice in the fall of 1974. I had the pleasure to talk with Mrs. Rice in March of 2003 and she remembers the car. It was actually her husband’s car. She told me she was afraid of that car -- Mr. Rice was probably doing burnouts down the street with it!! She did say sold it to an older gentleman after her husband had passed away. She is a very sweet old lady and even gave me her daughters phone number because she said “My daughter and husband would drive in that car to the beach sometimes” I called her daughter after that and she and I spoke briefly about the car and memories she had. She said she remembered being in the back fold down area looking up at the stars on some nights. The title trail goes cold until 1993 when a Mr. Coy Revis applied for the title. He and Mrs. Rice had to sign DMV papers to reissue the title. I spoke to Mr. Revis in February 2003. He is a character born in 1917 and still working on Mustangs at the age of 86! Goes to prove you’re never too old to be a Mustanger! He tried to sell me a real nice coupe for five thousand dollars. God Bless him! He remembered restoring the car. He had said that at one point during the restoration the car rolled down the driveway and dented the rear quarter causing more delays. Ouch! Anyway he detailed a lot of the restoration and I still have a lot of the original receipts. After the car was restored it was sold to Leonard Wardman. Leonard had the car photographed for the 1st edition High Performance Mustang book by Tony Gregory it’s the Arcadian Blue Fastback in the color photos of Editions 1 thru 3. Leonard sold the car to Roy S. from Tennessee in the l990’s. Roy really loved the car but he told me when I called him in 2003 that he needed to sell car soon after that. Roy was on the road a lot being a truck driver so the she sat most of the time in the humid weather and didn’t get much use. Roy sold her to Michael O. but he wasn’t really sure when. From what I been able to gather from Michael’s father Jerry is that he had it for a couple of years drove it a lot to shows and for fun and then traded it and some cash to Kelly Shultz of Kelly’s Muscle Cars for a 66 Shelby in need of restoration. 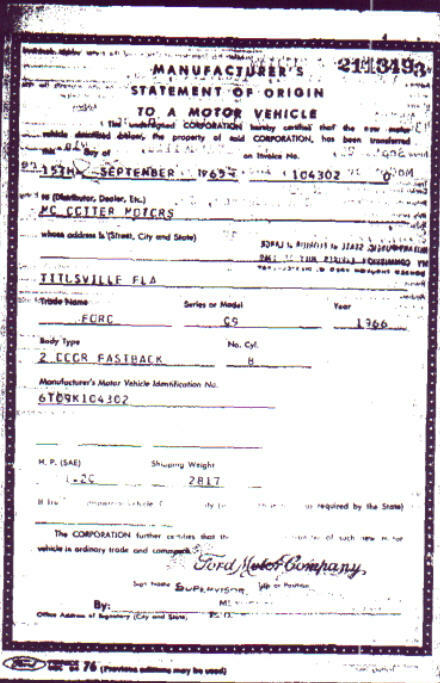 I bought the car in the fall of 2002 from Kelly who never even transferred the title to his name. So that puts me at the 8th or 9th owner of the car and hopefully the longest of the owners. Even though it had been restored it was in need of another restore again! Engine Code 289 CID - 4V "HP"